Tokyo, Japan, 2017-Aug-13 — /Travel PR News/ — ANA, Japan’s largest and only 5-Star airline, announced the opening of its first kids space “STAR WARS ANA Kids LOUNGE” on August 11, 2017, inside its ANA LOUNGE (Main Building South) located at Haneda Airport Terminal 2. 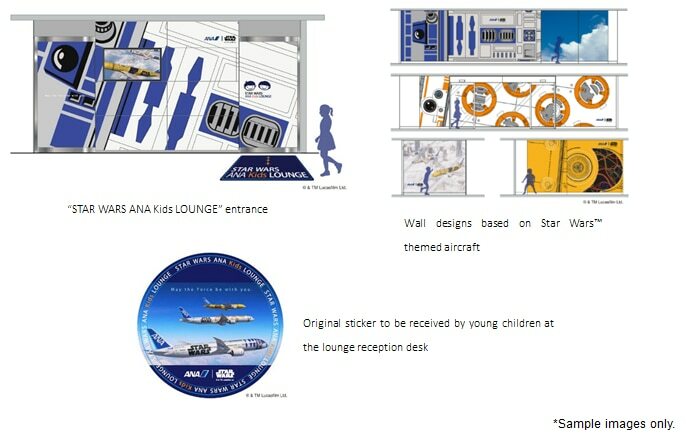 The design of the kids lounge is based on the Star Wars™ themed aircraft, R2-D2™ ANA JET, BB-8™ ANA JET and C-3PO™ ANA JET, that are popular among young children. In the LOUNGE, there is a slide, bench cushions, picture books and other items. The floor is covered with cushion mats to let young children play freely in a safe environment. Moreover, young children who come to the “STAR WARS ANA Kids LOUNGE” will be given a free sticker at the lounge reception desk. ANA passengers can relax and have fun with their young children at “STAR WARS ANA Kids LOUNGE” when they are on family vacation. ANA is the largest airline in Japan by revenues and passenger numbers. Founded in 1952, ANA flies today on 87 international routes and 117 domestic routes. The ANA group has 35,000 employees and a fleet of about 250 aircrafts. In FY2016, it carried 52.1 million passengers and generated revenues of 1.77 trillion Japanese yen. ANA has been a member of Star Alliance since 1999, and has joint-ventures with United Airlines on trans-Pacific and Asia routes, and with Lufthansa, Swiss International Airlines and Austrian Airlines on Japan-Europe routes. Its Frequent Flyer Program, ANA Mileage Club, has more than 26 million members. ANA was voted Airline of the Year for 2013 by Air Transport World Magazine, and in 2017 was awarded five stars for the fifth consecutive year by the world’s leading Airline and Airport review site, SKYTRAX. ANA is the launch customer and biggest operator of the Boeing 787 Dreamliner. This entry was posted in Adventure Travel, Airlines, Airports, Attractions, Entertainment, Hospitality, Travel, Travel & Kids, Travel Management, Travel Marketing, Travel Services, Travel Tips & Info, Travelers and tagged "STAR WARS ANA Kids LOUNGE", ANA, BB-8™ ANA JET, C-3PO™ ANA JET, Haneda Airport, Japan, R2-D2™ ANA JET. Bookmark the permalink.